A bingo hall in a former Edwardian cinema has swapped premises with a local church. Heaton Bingo in Newcastle no longer required such a large building. Elim Pentecostal Church, also on Heaton Road, needed a new site to accommodate its growing congregation and projects like food and clothing banks. Pastor Simon Lawton said his new home "looks big from the outside but when you actually walk round it's like a Tardis". 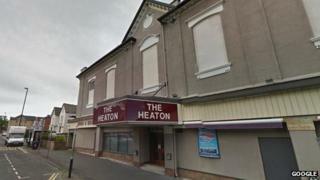 The bingo hall's owner suggested the swap, with Elim Pentecostal paying the difference, after the church showed interest in buying the hall, Mr Lawton said. Some members of the congregation have been unhappy their church has been turned over to bingo. "I think change is always difficult for people but I think we've helped them, or God has helped them, to see the bigger picture, which is far more important," Mr Lawton said. The church's new home is currently equipped with bingo hall, restaurants, a former dance hall and several bars. Mr Lawton hopes to install a several hundred seat auditorium to reflect the building's history as a cinema. Heaton Bingo manager Gary Annan said most of his customers had made the move to their new building and "the majority of them love it".